I headed to the freezer Sunday night for a nice tasty, no fat italian ice when I realized my daughter had eaten them all on me. I just wasn't in the mood for something heavy, and then I remembered something I have had for a few weeks in the deep freezer. 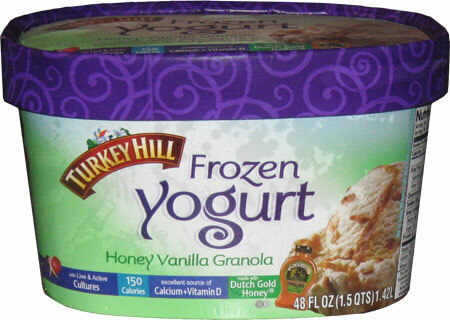 Behold Turkey Hill Honey Vanilla Granola frozen yogurt which is Honey Vanilla frozen yogurt with cinnamon granola and graham swirl (made with real Dutch Gold Honey). I still have fond memories of Pierre's Vanilla Honey Granola Yovation, but since I can't buy Pierre's around here, I'm hoping this might take it's place. Wow, nice healthy distribution of granola bits everywhere. You can't beat a good first impression... I take a few bites and am instantly overwhelmed by the taste of honey. Ok, here's the second impression about a half inch down the container. Notice the graham cracker swirls all over the place. They look kinda thin and scattered, but what's this chunk in the middle there? I go to scoop it up and out comes a giant chunk of graham cracker swirl. I take a bite and I am now in chilled graham cracker heaven! BETTER: I wasn't exactly a talented chef as a child, but I loved to make Jell-O pudding. Oh yeah, four bowls of snacking simplicity. If available, I would stick some "boring" graham crackers in a bag, smash them into oblivion, and then line the bottom of my bowls with bits. I would pour in the instant jell-o and wha-la! I always had trouble waiting for that first snack to sit and get solid. I guess I just loved the cold, smooth jello-o on the "crunchy" sweet crust... You know, I hate to use the word crunchy because that makes me think of pretzels or something else really hard, but I think you all know what I mean. 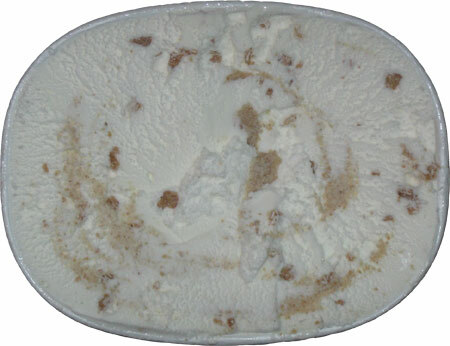 BEST: I adore this graham cracker swirl! To me, it has a nice sugary vibe, but it's not overly sweet. It also has a nice solid feel to it. It's not just some crumbly mess. It must have a little liquid in it to keep it in one piece. I absolutely love this swirl. I could barely stop myself from just eating the swirl... well, does it count as stopping if I've only gone back for swirl just once? What can I say? It's just this perfect, ice cold, kinda sweet concontion. It's not too hard, not to crumbly, it's just perfect in my mind and I am so very impressed at how they've managed to get a respectable and thick graham swirl into this froyo. Now if only the rest of this frozen treat could keep up. I fear Turkey Hill's honey vanilla granola really should just be called honey granola. The honey is drowning out everything. As a kid I remember thinking that it seemed like certain honeys taste way better than others... well, this one tastes like the kind I don't like. I felt the exact same way about some Häagen-Dazs Vanilla Honey & Granola Frozen Yogurt. There's just too much honey flavor for me to sit and truly enjoy this treat. Consistency and texture are decent. I get a little bit of a potential chewy vibe, but as is the case with certain flavors, the honey is so bold it really does mask the other attributes of this treat. I mean, I cant even really tell if there is a yogurt vibe or aftertaste because of the honey .. clarification: if you scoop just the swirl and only get a minimal amount of frozen yogurt, the honey really isn't an issue because you'll just be tasting graham cracker. A long time ago I was saying how I wish I could get my hands on Turkey Hill's Phillies Graham Slam because I was dieing to know how that swirl tasted, and now I know... I know they need to use this swirl way more often! I'm thinking this and a nice milk chocolate ice cream, oh yeah! Put some all natural whip cream on top and we have ourselves a frozen pie. On Second Scoop: As I expected, the honey flavor is never as bad on the second scoop, but I'm still not a huge fan, but as a disclaimer, I've never been a huge honey fan (unless it was on my 6 pack of McNuggets). I still unfairly love this swirl. I say unfairly because I dug straight into the heart of this container and dug up the huge spot where the swirl comes together in the middle (I took a picture, I'll post it later). I most strongly, completely, crazily, emphatically suggest to Turkey Hill that they use this mighty swirl to create the best S'mores ice cream flavor ever. Til that moment happens though, I think I need to track down their Peanut Butter Pie Froyo. oh! I was just about to say, Haagen Daaz has a honey vanilla granola flavor too! I kinda like it. I'm more of an off the beaten path flavor person. 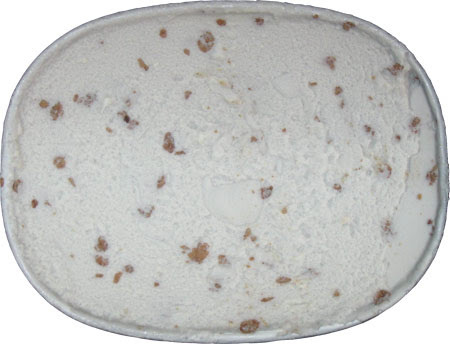 I actually LIKED the cold stone creamery ginger wasabi flavor from 5 years ago. Is Haagen Daaz honey vanilla granola discontinued? I cannot seem to locate it in the stores.Please help.